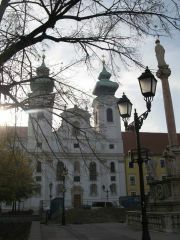 The Episcopate of Győr, founded by King Stephen I, flourished until the Turkish occupation of Hungary diminished its prosperity. 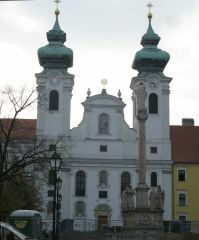 Győr, where the bishop resided, was only under Turkish rule for a short period, but the army of Suleiman the Magnificent ravaged the Episcopate on its way to and from Vienna (1529; 1532). Following liberation from Turkish rule, the city, an important link in the chain of Hungarian strongholds, was unable to return to normalcy as its infrastructure was in a state of decay. 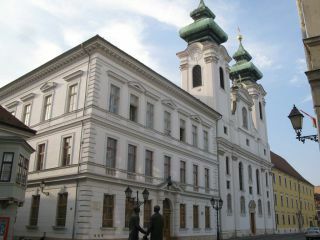 During this period, the bishop resided in Győr for short periods only. Apart from nurturing and supporting the spiritual life of Catholics, the renaissance of Catholicism in the 17th century also fostered the reconstruction of the city's infrastructure. The Jesuit order settled in Győr in 1627 establishing the church (dedicated to the founder, St. Ignatius of Loyola), monastery and school. 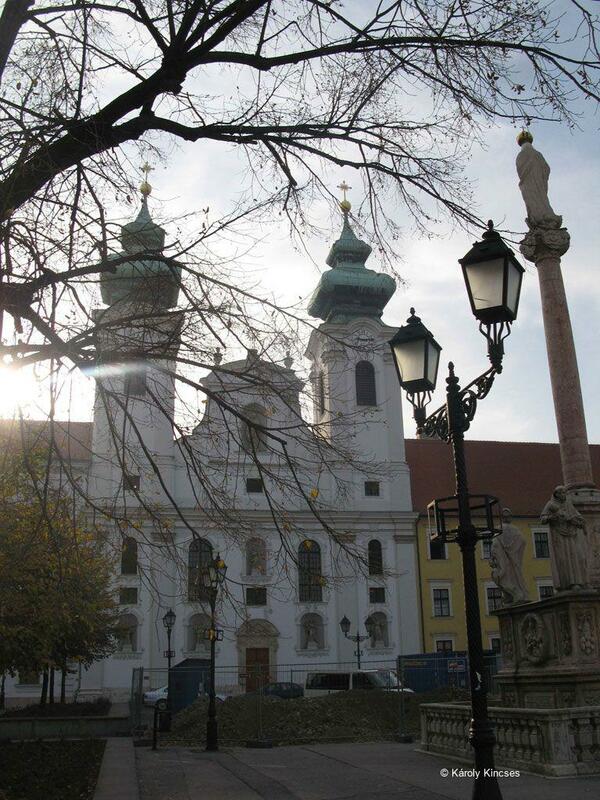 The Jesuits played a central role in the infrastructural restoration of Győr, as well as the spiritual, cultural and scientific life of the city, until the order was dissolved in 1733. The financial difficulties that beset the Jesuits meant that the construction and interior decoration of the church was largely financed by patrons, among which, Archbishop György Szelepcsényi, Prebendary Ádám Acsády, Bishop of Győr, other members of the chapter and the families of children that attended the Jesuit school. Scholars tend to attribute the plans of the church to an Italian master, Baccio del Bianco. The construction was supervised by the Italian Bartolomeo Torre (from 1634/1635 to 1641). 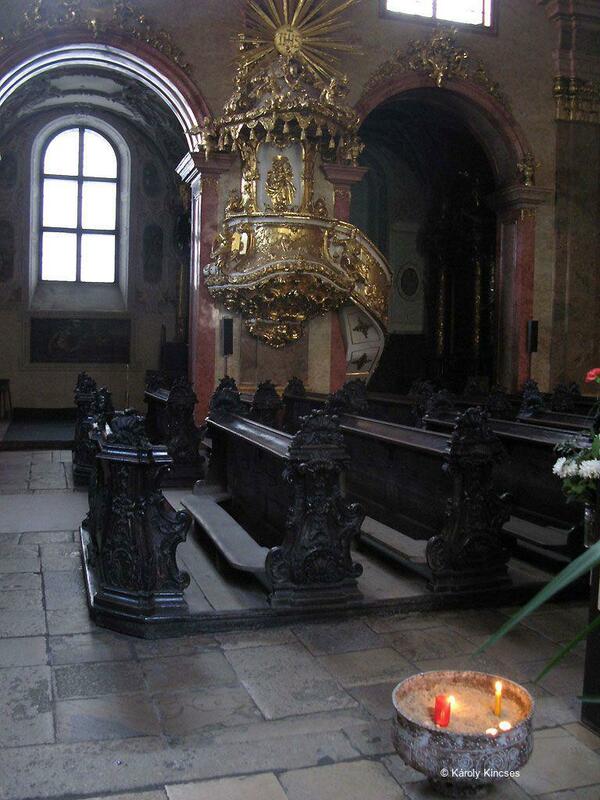 After the church was consecrated in 1641, local benefactors helped to install the first altars in 1642. 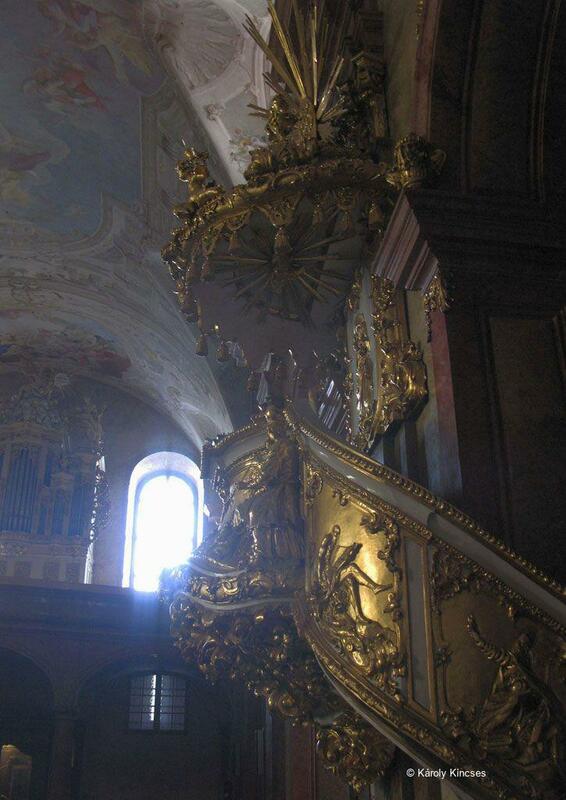 The second era of construction extended into the 18th century: the main altar, ceiling murals of the bay, the sanctuary, general interior decoration and decoration of the towers of the main façade. The nave took on its current form after reconstruction of the church in 1738. 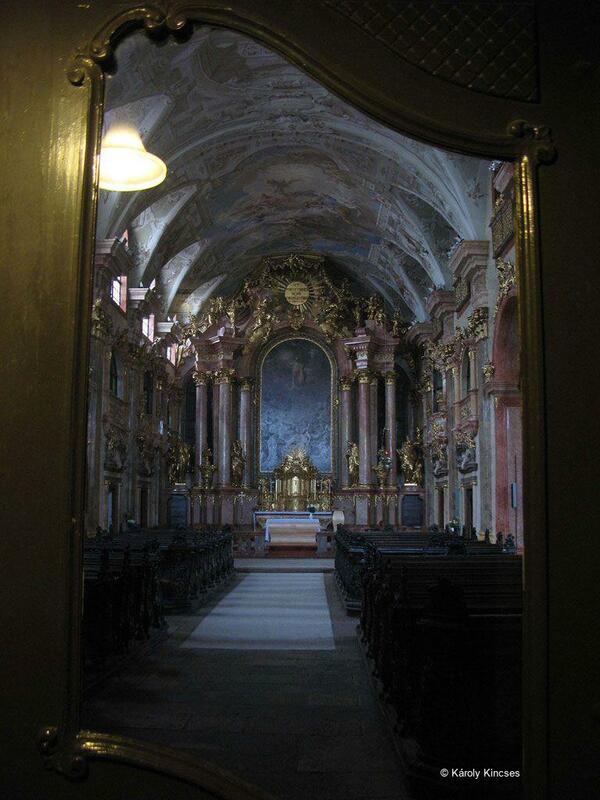 After the Jesuit order was dissolved in 1733, the Benedictines obtained the building complex in 1802. 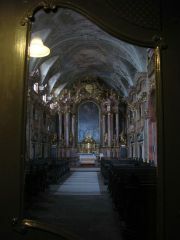 Today the church is a Roman Catholic parish church. In place of the former Jesuit school stands a Benedictine high school built in 1888. The former Jesuit pharmacy houses an Apothecary Museum. According to certain experts, the layout and architectural character of the Jesuit Church in Győr – besides the Italian patterns of Jesuit church architecture and the first church of the Order in Hungary in Nagyszombat (Trnava) – was influenced by the Jesuit Church in Vienna. 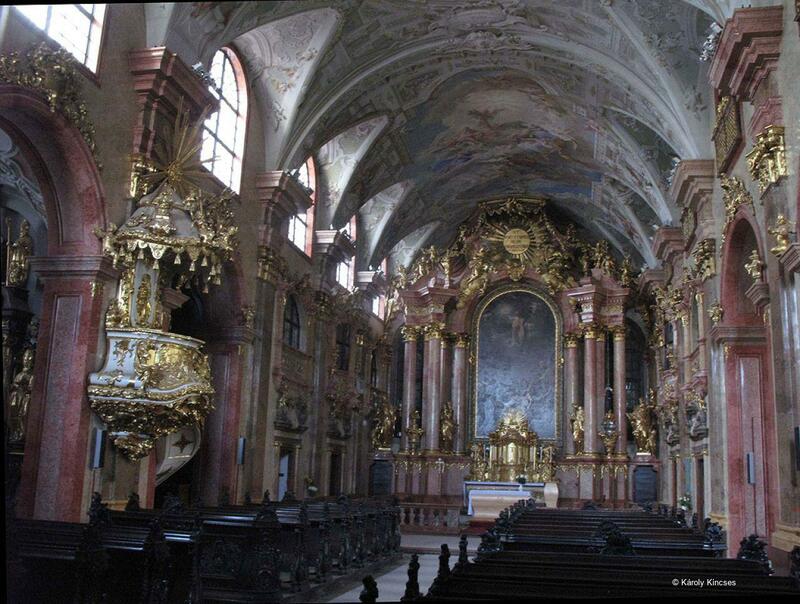 Its layout (a nave with three adjoining closed chapels on both sides) later became an emblematic element in Hungarian Jesuit church architecture. 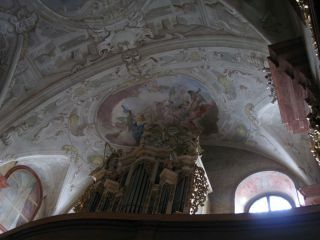 On the side walls of the nave topped by a barrel vault, there is a tabernacle. 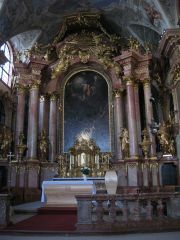 The sanctuary has a rectangular end, and is the same width as the nave. Besides traditional Jesuit iconography, specific features of Hungarian iconography from the period can also be seen relating to the Ottoman wars and the closely related theme of the Regnum Marianum/Patrona Hungariae (St. Stephen offering the country to the Virgin Mary). All the saints, kings and bishops lined up on the decorative programme were founders and supporters of the Catholic Hungarian Kingdom, and defenders against the infidels or non-believers (images of Turks and Protestants appear on the altars). The Tyrolean painter, Paul Troger, painted the main altarpiece (Apotheosis of St. Ignatius) and also the ceiling mural in the sanctuary (Ascension of St. Ignatius) in 1744; the ceiling of the nave (Annunciation) in 1747 and the murals of the vault pendentives of four Prophets and four Evangelists (dated with Troger's signature beneath St. Luke the Evangelist) in 1744. The trompe-l'œil architectural wall painting and the ceiling of the sanctuary are by Gaetano Fanti. 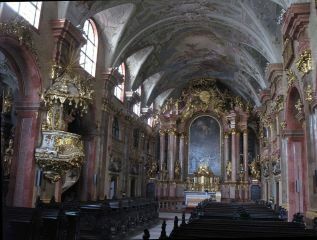 The main façade, completed by Martin (Athanasius) Wittwer a Carmelite architect around 1726, is articulated by statues in niches (St. John of Nepomuk, St. John the Evangelist, St. Andrew, St. Francis Borgia, the Virgin Mary and St. Ignatius of Loyola), by windows and volutes, two towers and the main stone gate (1641). 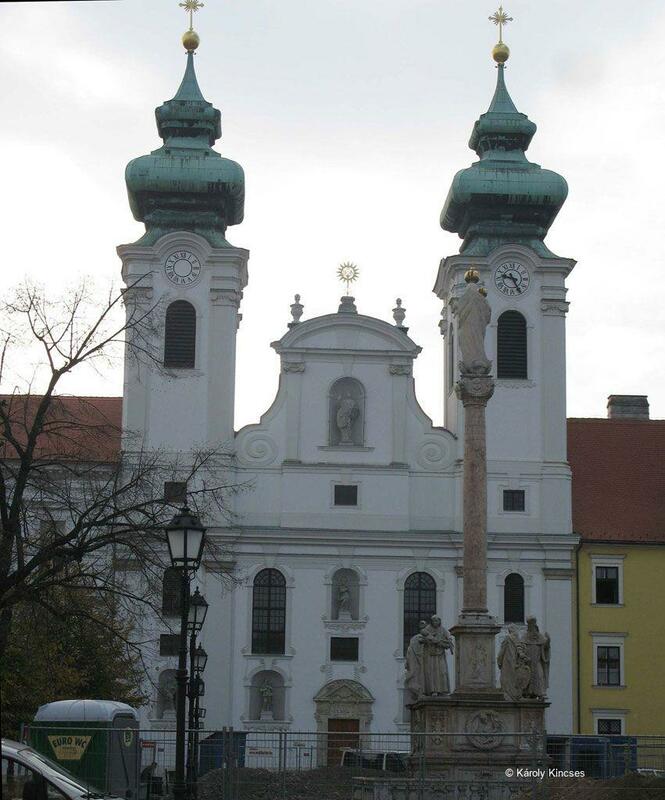 Between 1743 and 1744, János Götzelmayer from Győr created the main altarpiece adorned by two columns and sculptures representing St. Peter, St. Joseph, St. John of Nepomuk and St. Paul (made by Josef Rössler [Ressler]) and the coat of arms of the patron, Prebendary Ádám Acsády. Acsády's coat of arms also appears on the triumphal arch. 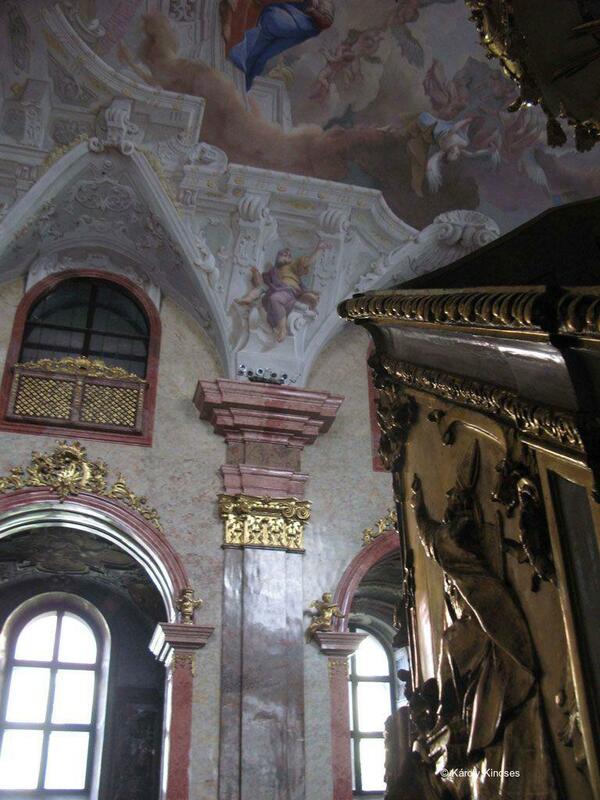 János Burghar(d)t from Győrsziget made the organ (1755–1757) and Mihály János Crines from Győr made the altar cross (c. 1710). 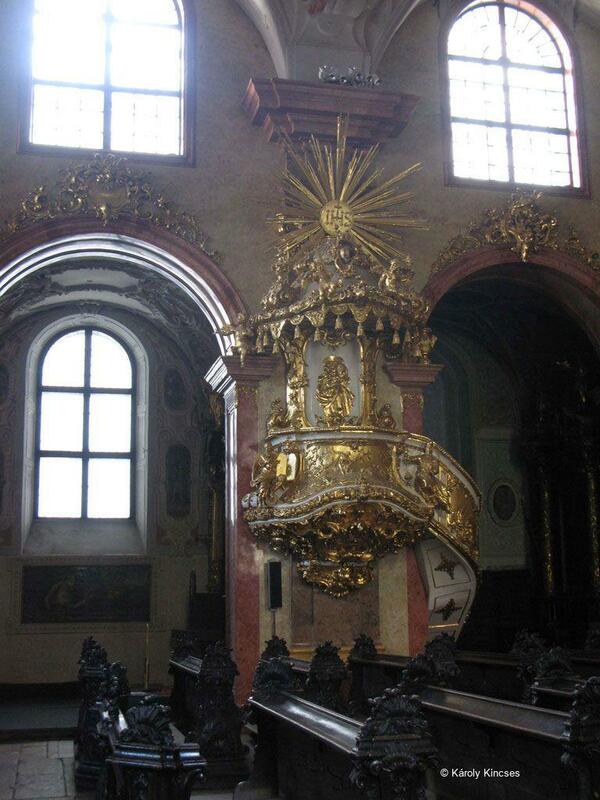 The embossed pulpit was donated by Bishop Márton Padányi Bíró and made by Lajos Gode, a disciple of G. R. Donner, in 1748–1749. 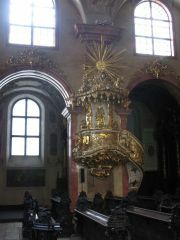 József Ullydeszki made the ciborium in the mid-1780s. The furniture is by local craftsmen. 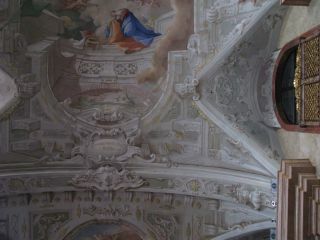 Both the monastery refectory and the former Jesuit apothecary are decorated with stuccoes. 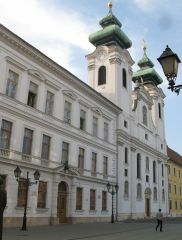 The Jesuit Order settled in Győr in 1627 and played an important role in the Catholic spiritual renaissance (rooted in the Counter-Reformation movement) and the spread of Baroque art in Hungary. Building of the Jesuit Church dedicated to St. Ignatius of Loyola began in 1634/1635. 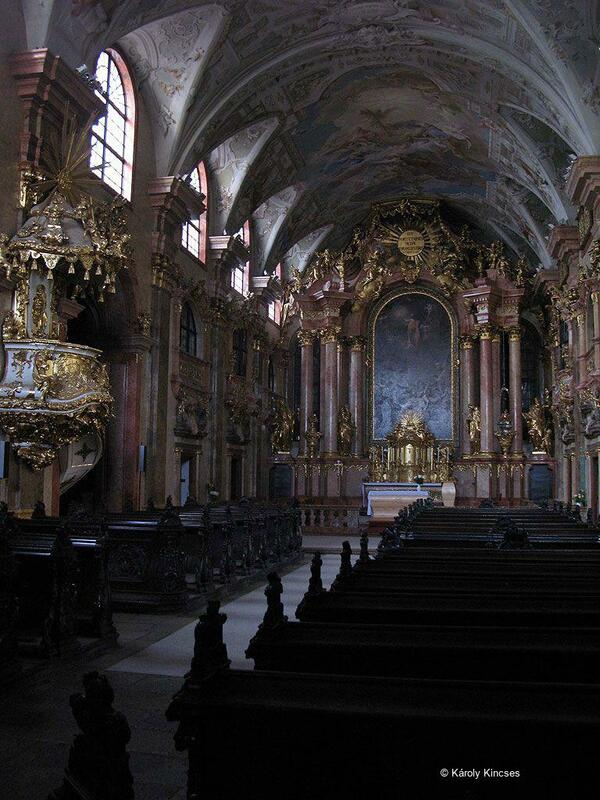 The church was consecrated in 1641, but the interior decoration was not complete until the mid-18th century. Based on written sources, signed artworks and stylistic research. Pigler, A., A győri Szent Ignác templom és mennyezetképei (The Church of St. Ignatius of Loyola in Győr and its Ceiling Murals), Budapest, 1923. Heinzl, B., “Die Freskomalerei Paul Troger” (“Paul Troger, the Fresco Painter”), Wiener Jahrbuch für Kunstgeschichte (The Viennese Yearbook of Art History), XIX, 1962, pp. 193–194, 196, 202. Kászonyi, A., “Bartolomeo della Torre, a győri jezsuita kollégium építőmestere” (Bartolomeo della Torre, the Master Architect of the Jesuit Monastery in Győr), Arrabona, 1963, pp. 229. 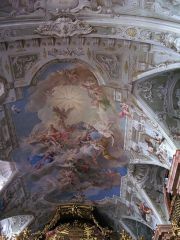 Galavics, G., “A barokk művészet kezdetei Győrben” (“The beginning of Baroque Art in Győr”), Ars Hungarica, 1, 1973, pp. 97–126. Genthon, I., “Szent Ignác templom” (“The Church of St. Ignatius of Loyola”), Magyarország művészeti emlékei (The Souvenirs of Hungarian Art), Budapest, 1974, pp. 126–127, 391—392. Galavics, G., “Szent Pál a damaszkuszi úton – Párizsból hazajövet” (“St. Paul on the Way to Damascus – returning from Paris” (Egy Laurent de la Hyre kompozició a győri jezsuiták oltárképén – A Composition of Laurent de la Hyre on the Altarpiece of the Jesuits in Győr), Ars Hungarica, 22, 1994, 1, pp. 51—57.